Well, I finally got a new phone. In the end I decided to “think different” and not get an iPhone. 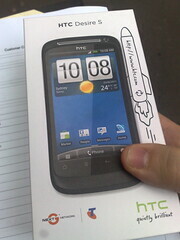 Instead I’ve got the HTC Desire S, running Android 2.3. Suffice to say, still getting used to it after the ol’ Nokia N95, but enjoying it a lot so far. While your at it I think you should ‘like’ my facebook page of “Adventures of the Portsea 788” its proving to be very popular! If you look at the recent update, I’ve also just emailed channel 7 news to see are they interested in the assault that happened and also how poor the bus line really is. Well done Daniel. I wanted a nokia n95 when I upgraded last time but wasn’t able to get one on contract with telstra( the only way I could afford the new phone) Missed out by less than a month. So I went the iphone. nice nifty gadget but I’m sure there is an android phone out there I’d like even better. haha, way to use their own slogan against them! Thanks for letting us know, Daniel – I was wondering about this. I am about to get a new phone and feel the pressure to get an iPhone but I tend to swim against the tide so have been looking at Andriod phones. I have been tossing up between the Samsung Nexus and the HTC Desire S – both of which I can get ‘free’ on the plan. My phone is used for life and work, so gets a fair bit of use. I am not much of a techo, but have worked out that I need Android 2.3. Love to hear how you get on with your new phone – keep us updated. Actually, looking at the picture on geekrant there is not a lot of difference between the Samsung and the HTC. The primary visual one seem to be that the ‘buttons’ at the bottom are in a different order, but the same four ‘buttons’ are there. I have the Nexus and I’m fairly happy with it. One of its good points is that there is a hardware button on the side to ‘lock and close’. I had an SE Xperia and there was no way to close that except wait for the keyboard timeout to occur. @Louise, yeah liking it so far. Check the geekrant link. @PaulK, yeah this one has a hardware lock/close button at the top, also used to shutdown/go into “airplane mode”. The HTC does have an SD card slot (and came with one) so it’s nice to know it can be expanded if necessary.